As technology continues to advance, keys have too. New types of keys help make our homes, properties and cars safer and harder to enter without the proper tool. 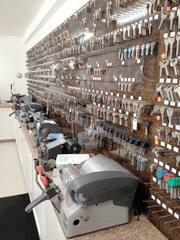 With many different types of keys available, it is important to speak with a professional locksmith if you require a duplicate key, if you lose a key, or if you are interested in updating your key and lock system in your home or other space. Here are a few of the most common types of modern keys. Transponder keys are common in new vehicles. They utilize a radio signal that is activated when within a certain area of the car or when a key is put into the ignition. These keys are incredibly hard to duplicate, which makes theft very difficult. The key itself is designed to prevent auto theft. Often known as double or four sided keys, these are typically used for residential locks. Instead of having teeth on just one side, a two or even four sided key helps keep your home more secure because of the harder to pick locks. Using keys like this are a simple way to improve home security. While more often used on ring locks, bike locks and others, a tubular key features a cylindrical shaft that is used to open tubular pin tumbler locks. This key is also known as a barrel key. This type of key and lock system is growing in popularity because they are essentially impossible to pick. An Abloy key is used on disc tumbler locks. Another type of key and lock system that deters picking is a paracentric key. It is most recognizable by its smaller teeth and odd blade shape. If you need new specialty keys in Reno you can reach out to Reno Sparks Lock & Safe. We are able to duplicate any type of key. We have kept up with changing lock and key technology in order to provide the highest type of security possible. To learn more or to request the assistance of a professional locksmith in Reno stop by or give us a call at (775) 525-5712. We look forward to helping you!